Brief Synopsis – A gold and silver prospector in the early 20th century does all he can in order to become a powerful businessman. My Take on it – Daniel Day-Lewis has been called one of the best actors of his generation and his transformation in Daniel Plainview in this film is more than enough reason to believe such a claim. His depiction of this lustful man who craves power over everything else in life is such a scary and intense portrayal that it carries this whole film the whole way through. 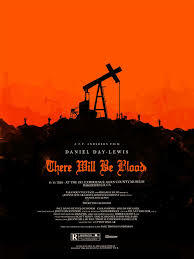 This film gives us a very unique perspective on the oil business and how it was run and it’s clear to see that business practices haven’t changed much over the past century especially when it comes to money and power. The story is slowly paced but still fascinating to watch because there is so much going on the entire time and it’s sometimes a chore to absorb it all. The story manages to juggle so many important issues that is remains gripping to watch; religion, family, the oil business and of course the wielding of power are just a few examples of the issues shown. It’s quite unfortunate that this film only managed to win 2 of its 8 Oscar nominations despite being better than most (if not all) of the other nominees in most categories. It won Best Actor for day-Lewis and Laos Best Cinematography for beautifully shot landscapes of old California. Paul Thomas Anderson is able to prove with this film once again how great a director he truly is. Bottom Line – Such an amazing film mostly due to the superb performance by Daniel Day-Lewis in the lead role. We are given such a unique perspective of the oil business and we get to see how things haven’t changed much over the last century when it comes to money and power. The pacing is quite slow, but so much happens that it doesn’t matter because there is so much to absorb as it moves along. The way that this film juggles issues of family, religion, the oil business, success and of course power is so gripping to watch. It unfortunately only managed to win 2 of its 8 Oscar nominations (Actor and Cinematography) despite being perhaps the best of the lot of films in the competition for Best Picture. Anderson proves once again how great a director he can be. Highly Recommended!